Don’t panic, green hair hasn’t just come into fashion – but green as in ‘eco-friendly’ and free of nasty chemicals has. 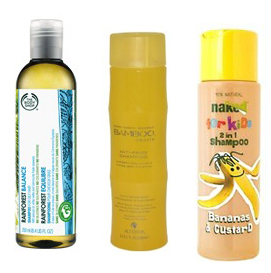 Read on for our top ‘green’ shampoo and conditioner combo’s. Up until fairly recently, most women on have based their buy or bin beauty decisions on the packaging and fancy marketing of a product, and have certainly not given much thought to scrutinising the small print ingredients on the back. However, recent years have seen a proliferation of women wanting to go ‘au natural’ in their beauty regimes. But why? I hear you cry. Well the reason is this – for years now two chemicals in particular – parabens and sulphates, have appeared in the ingredients list of most personal care products. Sulfates have long since been used in items such as washing up liquid and other household items, and their purpose is primarily to attract dirt and oil before breaking them down. Sulfates are also responsible for creating the sudsy bubble effect. Parabens on the other hand, are used to preserve products and prolong their shelf life. Now, whilst both of these products have been used in thousands upon thousands beauty products for years without causing any serious issues, and whilst they certainly won’t make your hair fall out or your skin turn yellow – they can have a negative impact over a prolonged period. With this in mind, many women are now favouring a more natural approach to beauty. A great everyday shampoo that contains no silicones, no sulphates, no parabens and no colourants. Body Shop products have also not been tested on animals.The rainforest range is also available in volumising, shine, moisture and radiance formulas. Alterna products do come with a high price tag but as the saying goes, ‘you get what you pay for’. This range is fantastic. The collection only contains certified organic ingredients that are grown responsibly and traded ethically. Every product in the Bamboo Smooth line is made with eco-certified, fair-trade compliant, certified Organic Pure Bamboo Extract and Kendi Oil, both of which are responsible for sleek and frizz free hair and great colour retention.This line is also vegan friendly. Why is it that when we were wee, all we wanted to do was parade around in our mothers high heels whilst wearing her lippie and expensive perfume, but as soon as we reach adulthood we want to rewind the clock and do finger painting and cut our sandwiches into triangles with the crusts off?The grass is always greener! Well if you happen to be an adult who secretly feels that children get all of the best and most exciting products, you’re not wrong! Naked’s natural shampoo range for kiddies is a sulphate, prarben and silicone free range that comes in two incredible flavours/scents – Bananas and Custard and Jam Sandwiches. The formula is great – extremely gentle but still leaves your little rascals with clean and healthy hair. If we had kids, we would definitely be stealing a bit of this in the shower! The Naked kids range is also extremely affordable at only £2.99 per bottle. Nip down to Boot’s now to pick yours up.